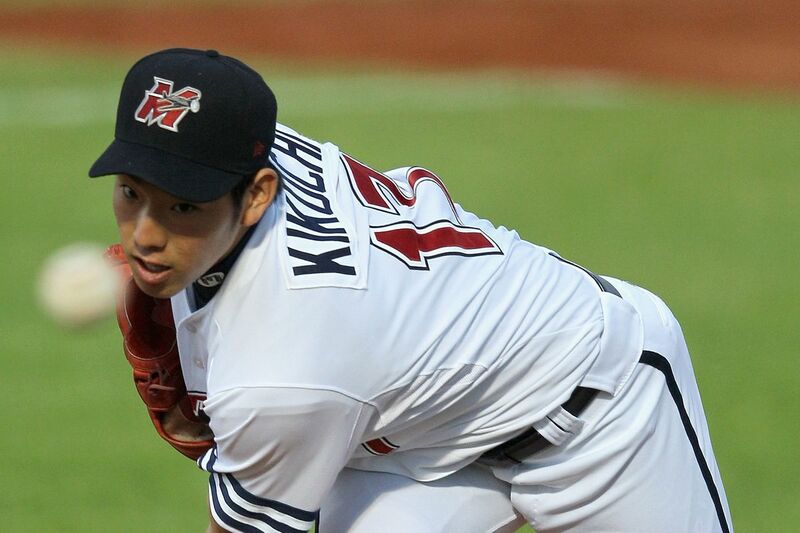 If you want to read a more in-depth look at Kikuchi, check this out. Basically, he has been a top starter in Japan for around six seasons and is only 27 years old. Although he profiles as more of a mid-range starter, he has great stuff, sitting mid-90’s with his fastball, and has a Lucchesi-like curveball. That’s all we’ll do for the rotation as the rest of the spots will go to a combination of Lucchesi, Lauer, Nix, Paddack, Richard, and whatever prospect or minor league signing has an unexpectedly strong spring. Now for the left side of the infield. There are plenty of stop-gap third basemen (Asdrubal Cabrera, Logan Forsythe, Josh Harrison) and shortstops (Jose Iglesias, Adeiny Hechavarria, Freddy Galvis) in free agency who should be around deep into the offseason. Heck, if the Padres can find a way to sign either Manny Machado or Josh Donaldson they should, but the long-term implications of one of them signing could handcuff the team for years to come. We’re going to get a little creative here, avoiding the free agent market and instead looking to the trade market. This is a classic sell-high on two players that may or may not eclipse their 2018 production. Renfroe made positive strides with the bat in 2018, but his offensive game is still pretty one-dimensional. He struggles to get on base and his value lies solely in his power. 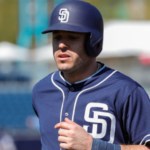 The emergence of Franmil Reyes has made Renfroe expendable and trading him also allows Wil Myers to move back into the outfield. 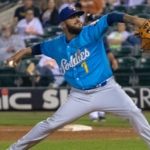 Yates had a career year for the Padres in 2018, posting a 2.14 ERA (2.54 FIP) and struck out 36% of the batters he faced. 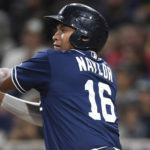 The Padres would be smart to sell high on him if possible as they have the depth to overcome his loss. 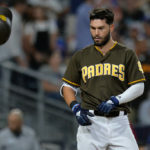 As a group, the Padres pen accrued the second-most WAR, sixth best ERA, and fourth most strikeouts per nine in all of Major League Baseball. The Braves, on the other hand, had a middle of the road pen that hurt them in the postseason as they lacked a go-to reliever. Yates could be just that for them. For the Padres, they are able to plug their hole at either third or short, depending on where the team wants to play Camargo. He has experience at both positions, but really thrived as third baseman last year. Camargo posted a 115 wRC+ across 134 games in 2018 and will be 25 when next season starts. He also posted a .349 OBP and chipped in 19 home runs. De La Cruz and Riley will play the 2019 season at just 21 years old each. They are both starters who like to play off above-average fastballs. 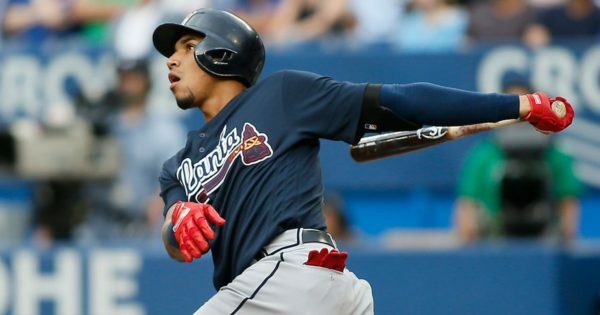 Camargo is the real prize of the deal, so it’s hard to see the Braves giving up a highly-touted prospect such as Kolby Allard or Mike Soroka. That being said, De La Cruz and Riley are real breakout candidates and could flourish in San Diego’s system. The Padres should avoid a full-roster reshuffling and look to add established talent wherever possible. They should be in on every star-level player available and should be adding pieces that will be around when the talent finally meshes and the team takes off. San Diego has been home to mediocre past-their-prime players for far too long and must add talent that can take them to the next level or risk wallowing in mediocrity another ten-plus years. Even if they don’t make these specific moves, they need to do something if they really want to contend in two years. Born and raised in Vista, Ryan has been a Padres fan since birth. 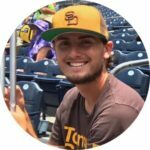 Currently attending Palomar College, Ryan is trying his hand at expressing his passion for baseball through writing. There is no better life than the baseball life. 2 Weeks later and Paxton is a Yankee. -Working a trade with the Reds for Suarez would be a great start. -Gio Gonzales would be a very decent piece at 2 years and 20 MAX. -The rumored deal with the Mariners would make a lot of sense and I’m guessing there are more moving parts to that trade then a 2 for 1 contract swap/change of scenery kind of deal. But Segura at SS and Leake joining the staff are upgrades indeed. – Syndergaard deal… High Risk/High Reward given the injury history and it will be costly to acquire him. Tatis/Gore kind of costly. 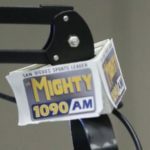 – Realmuto deal makes a TON of sense IMO and this could be a more significant move than the others. SD has a payroll sitting around 75 million… The Padres should have a 150 million payroll each and every season and it’s unacceptable to keep using the small/mid market argument for a franchise that is consistently in the top 10 most profitable MLB teams over the last decade. Suarez isn’t available and there’s no need for Realmuto. If they can add Thor and Suarez without having to deal Tatis, Urias, Gore, Paddock, Pattine and Meija then let’s pull the trigger. Those are our high probability guys who should perform. The rest are just prospects at this point. But adding those 2 proven, young cost controlled studs and keeping the prospects mentioned, puts a serious squad on the field at a decent cost. SD really wouldn’t have a weak position + a nice young starting 5! Paxton is a little too close to free agency for my taste. Wouldn’t be opposed to the other moves you mention tho. Well thank God he is not Preller. Myers should be in the first trade with Allen for a more reliable starter. Thor from the Mets come to mind. And a trade for Sano should be second. 3rd should be a signing like bringing craig back to close. Not sano for 3rd. Cubs are looking to move kris bryant so let’s trade Wil and a hand full of prospects to bring him home!! Cubs aren’t looking to move Bryant and even if they were they would not be taking Wil Myers in the trade. Wil Myers makes a trade package worse, not better. Absolutely no chance that the Mets acquire Myers in a trade that involves them losing Thor. Even with the injury concerns Thor has a ton of trade value. Myers has negative trade value. The Mets aren’t trading Syndergaard for that and the Twins aren’t selling low on Sano. Not opposed to any of the three. Its nice to see someone putting thought into it and making sound deals. Not sure you are going to get Seattle’s ace for one pitcher though. Camargo is a younger, cheaper Segura, would be great but instead of two pitchers, get Max Fried back to replace Baez.. While I agree with the premise and positions that need addressing, I disagree with the pitcher you are after. Those are some decent prospects for a starting pitcher that will be 30 and has never pitched in 30 games or more than 160 innings in a year. Hardly ace material. For those prospects, I’d like a little more. I would rather sign Keuchel or trade for a Kluber. Some good ideas here, but a team that won only 66 games needs a full-roster reshuffling. You have the makings of a good article here, which is then cheapened by the bait of fictional trades. The problem with this type of conjecture is you pigeonhole your good ideas to one scenario while opening yourself to a bevy of criticism. That criticism of course, has little foundation, which unfortunately conforms to what you have scripted. In other words, you are bringing the audience up to your level, or you down to theirs, depending on how you view things. As the average fan, we may not be able to argue with your analysis… but you give us that ability once you want to trade some beloved so-and-so. 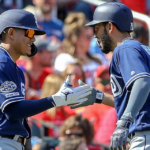 -Why not analyze the Padres’ needs and pose your points that way? Use your conjecture on the possibilities which complement your research: They need a 3B- here are the options and best fits. They need a top of rotation starter- here are the options and best fits. -Here are potential trading partners whose needs match our resources, etc. You’re then teaching me and helping to form my opinion rather than simply evoking an emotional response- the latter of which is cheap writing. You have a good tone for writing and a good command. A lot of your colleagues seem invested in writing about trade scenarios and who the Padres should “get”. This amateurish approach hinders any decent analysis and is formulaic of daft research and poorly considered imitation. It should die on the drawing board. I’d do a 2.0 on this one personally, you have good stuff. With your essay of criticism, why didn’t you write the article bud? Your constructive criticism reminds me of the 1989 Joe Carter trade. 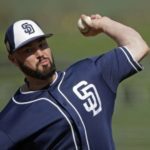 Paxton does make sense for the reason that the Padres are looking for a controllable young starter. The moves I think the Padres should make this offseason is trading for Jose Urena and Eugenio Suarez, and signing free agent Kikuchi.